Want the taste of bacon, but can't stand the inconvenience of actually cooking it. Squeez bacon is the answer! Simply squeeze the tube, and you'll have instant bacon on your pizza, your sushi, even on your Rockmelon! It's bacon, where you want it, when you want it. Could you wish for anything more? A few years after WWII ended, a young man working in a small restaurant in Sweden developed a new way to process bacon. By precooking it and blending it in a special way, he was able to make a fully cooked 100% bacon paste that could be squeezed from a tube. Knowing he had discovered something paradigm-shifting, young Vilhelm LilleflÃ¤sk quickly went into business. That, dear friends, is when Squeez BaconÂ® was born. And this delicious delectable from Sweden has finally been brought over to the USA - now with American Flavor! We've been working for months now with Vilhelm LilleflÃ¤sk (yes, he still runs the company!) to bring Squeez BaconÂ® here, and boy are we proud. Why? 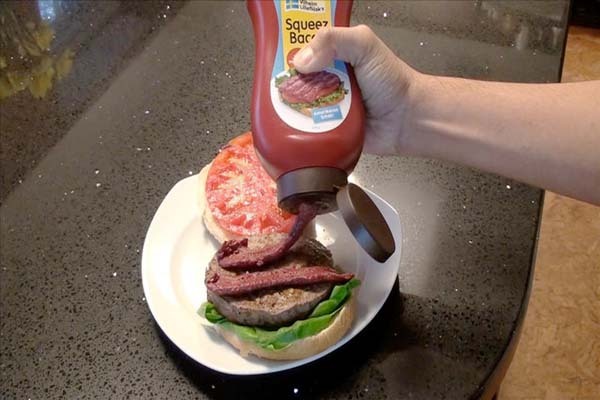 Because Squeez BaconÂ® is simply the tastiest bacon food product ever made. Did you know that it's rumored ABBA met while eating Squeez BaconÂ® sandwiches? And even IKEA founder Ingvar Kamprad (we've heard) never travels without a case! He loves it on his American style meatballs. Ojojoj! 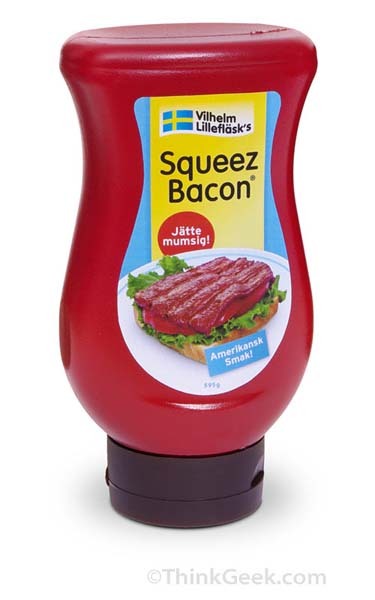 Vilhelm LilleflÃ¤sk's Squeez BaconÂ® is fully cooked 100% bacon. Due to the patented electro-mechanical process by which Squeez BaconÂ® is rendered, it requires no preservatives or other additives. Each serving is as healthy as real bacon, and equivalent to 4 premium slices of bacon! You can put it on sandwiches, pizza, pastas, bacon, soups, pies, eat it hot or cold (warm Squeez BaconÂ® on toasted rye is to die for), substitute it for bacon in your recipes, or even eat it right out of the tube like we do! 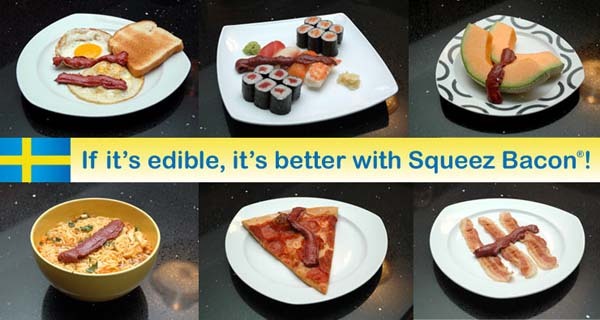 If it's edible, it's better with Squeez BaconÂ®. In the immortal words of Vilhelm LilleflÃ¤sk, "Aldrig kommer att ge dig upp!" Once you get a taste of Squeez BaconÂ®, you'll know exactly what he meant. Product Features * Each tube contains 21oz (595g) of Squeez BaconÂ®. * 16 servings - equivalent to 64 slices of bacon! * Bottled in Sweden, made from U.S. bred swine. * Shelf Life of 12 years. * No refrigeration needed. * JÃ¤tte gott! April Fools are only funny on April 1st. Reposting stories after that date is wrong and should be punishable. I really need to eat this when I visit my swedish SSBBW girlfriend! I always liked bacon, the fattening the better! No updates on this site for a month, whats going on? Time to remove from favourites????!!!! Watch this space... there will be stories in the next 24hrs!!!!!!!! Iâ€™m sure some food conglomerate is now feverishly working on it!